Mosaic tiles can be extremely beautiful if the right colours, materials and location is chosen wisely. Bathroom mosaic tiles come in many different shapes, sizes and most importantly finishes. Introducing bathroom mosaic tiles is simple, you can easily cut them down to form a stylish border around your shower cubicle, alongside your bath or above your bathroom sink. A question many people tend to ask us here at Mosaic Village is, can mosaic tiles be used in showers? Can I Use Glass Mosaic Tiles In The Shower? Glass mosaic tiles are perfect if you are working with sanitary ware particularly if you are looking to use blue and white colours – a popular choice with bathrooms. Glass mosaic tiles are extremely easy to clean with no need for expensive cleaning products or scrubbing tools. 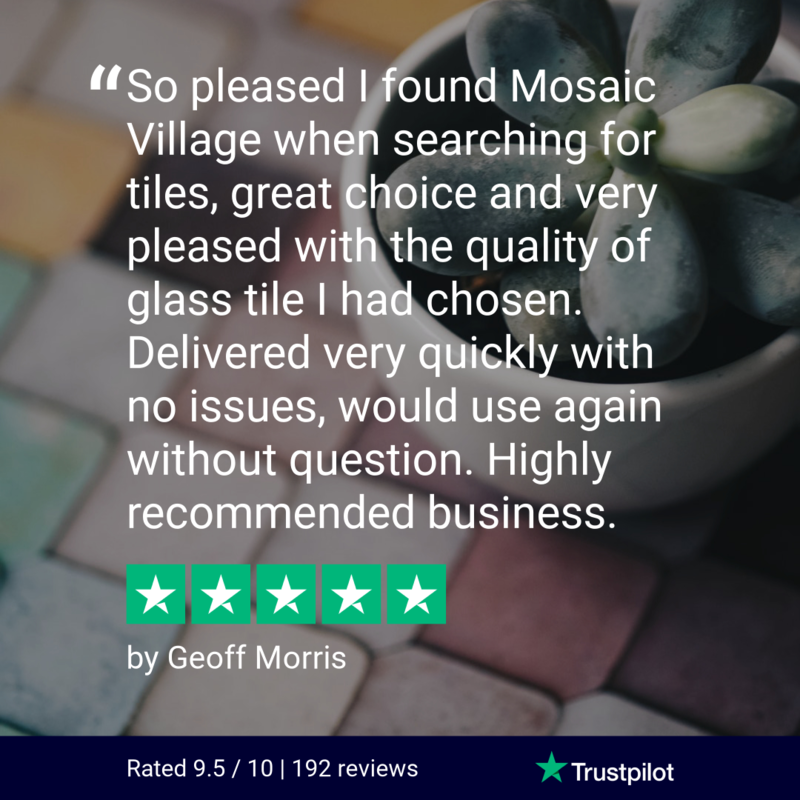 When introducing glass mosaic tiles to your bathroom you have the choice to eliminate waterproof paint meaning your bathroom can sparkle all day, everyday! Glass mosaic tiles are extremely popular when incorporated with a simplistic glass shower door, you can then make a statement using the glass mosaic tiles along the shower with no about getting them getting wet. Can I Use Brick Mosaic Tiles In The Shower? Many of our customers believe that if you introduce brick mosaic tiles in a shower, they will lose their quality instantly – this couldn't be further from the truth. Brick mosaic tiles can sustain a lot of water, humidity and steam as well as being extremely easy to clean – which is key for everyday shower cleaning. Another misconception with brick mosaic tiles is that they are rather dull and don’t have the potential to bring life to a room, here at mosaic village we make sure to stock only the best quality and most glamorous brick mosaic tiles, to make sure that your bathroom is bright, beautiful and reaches its maximum potential. Can I Use Mixed Mosaic Tiles In The Shower? Mixed mosaic tiles are exactly how they are described – a mixture of mosaic tile materials. The most popular mixed mosaic tiles are made up of brick and metal – making one perfect, easy to clean and bold mosaic tile. Mixed mosaic tiles are perfect if you want a mixture of styles and colours for your bathroom and even though these particular tiles are made out of two different materials, this doesn’t affect your ability to clean in the shower. Can I Use Metal Mosaic Tiles In The Shower? Metal mosaic tiles are suitable for showers but we don’t advise you to use them on the floor. Additionally, with metal mosaic tiles you should be careful with regards to your cleaning products – products that contain acids, such as chrome cleaners can damage the mosaic tiles and affect their quality and waterproof ability. We hope this guide on mosaic tiles has brought you a better understanding of whether you can use mosaic tiles in showers.